UP Assistant Professor Salary Good News for Teacher, Lecturer and Employee working in Degree College and University. UP Government University Assistant Professor, Lecturer 7th Pay Commission will count from 1 January 2018. On Thursday 13 September 2018 Ministry of Human Resource department issued UP Assistant Professor Status after recommendation granted by Uttar Pradesh. Assistant Professor Salary in UP: - Pay Scale, Allowance (Bhatta) will be issued according to University, Deemed University and Degree College. 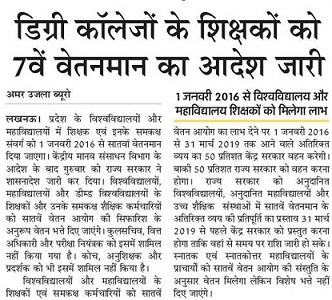 However some posts (Kul Sachiv, Finance Officer, Exam Regulatory Officer, Coach, Anushikhak and some group b non teaching) were not included in salary hike but sooner or later they will getin UP University 7th Pay Commission. 50% Salary Load Beared by Central Government From 1 January 2016 to 31st March 2019 in all UP Degree College Group C Employee, Lecturer and Assistant Professor of University. But here is problem new problem come in Light for state government i.e. they will show the presentation of Salary Payment with Budget issued on it. Pay Scale: - 7th Pay Commission to Teacher and Group A, B and C Employees in UP. Issued Date: - 1.01.2016 to 31, 03.2019. Institute: - Degree College, University, Deemed University, Self Finance Degree College.